Whether to choose an upstream Yangtze River cruise or a downstream one is always a confused question for cruise travellers new to plan a Yangtze River cruise in China. Here you will know what are the upstream and downstream cruises, and differences between them, and then have a clear idea to make the best decision. What is Upstream & Downstream? Since the Yangtze River runs from the western to the eastern part of China, the upstream Yangtze River cruise is the sailing from the lower part of the river, passing Shanghai, Nanjing, Wuhan, Yichang, to the higher parts, such as Chongqing. ● 5 days & 4 nights Yichang to Chonqing cruise. It is the most popular route and the golden section along the Yangtze River. ● 7 days & 6 nights Shanghai to Wuhan cruise. the brand-new designed middle length cruise by Century Sky for your classic savory of culture, history, sightseeing and folk characteristics along the middle and lower part of Yangtze. ● 11 Days & 10 Nights Shanghai to Chongqing cruise, is the longest and most relaxing Yangtze cruise route, with a stopover in Wuhan City and the shore excursion to Mt.Jiuhuashan. It is ONLY operated by Century Sky in 2019. Important Notice: there are only cruises sailing between Chongqing and Yichang in the whole 2019! All Century Cruises, Victoria Cruises, President Cruises, Yangtze Gold Cruises, Changjiang Cruises and Yangtze Explorer offer the 5 days & 4 nights upstream cruise and get positive reviews from guests. Choose your favorite ship. Yangtze River downstream cruise follows the flow of the river from the western to the eastern China. This sailing is from Chongqing, passing Yichang, Wuhan, and Nanjing to Shanghai. ● 4 days & 3 nights Chongqing to Yichang cruise . That is the most favored Yangtze River cruise route booked by most Yangtze travellers in China. 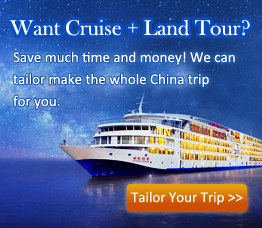 You can enjoy such downstream cruises by selecting your ideal ship from all Yangtze River cruise ships. ● 7 days & 6 nights Wuhan to Shanghai cruise. This is the specially offerd cruise route only available for Century Sky cruise visitors to see the famous attractions such as Jingdezhen, Mount Jiuhua, Confucius Temple, and other highlights to know the cultural, historical and scenic essence along the eastern Yangtze reaches. ● 11 Days & 10 Nights Chongqing to Shanghai cruise, is a relaxing Yangtze cruise that is also ONLY operated by Century Sky in 2019. The ship will stop over a series of amazing destinations including Nanjing, Jindezhen, Mount Jiuhua, Wuhan, Three Gorges Dam, Three Gorges, etc. for your leisure and meaningful enjoyment of the full mother river in China. In 2019, Century Sky cruise ship also offers the special and long expecting sailing between Shanghai and Chongqing for 10 nights and 11 days. During this most relaxing cruising holiday, it takes visitors to see the top great culture, history, sightseeing, and many other essences of cities along the Yangtze River, from its upper, middle to the lower section. Just for your comprehensive knowledge of this great river in China! Upstream and downstream Yangtze River cruises are different with the cruise length, sailing hours, schedule arrangement, and also the price. Check them as below to see which cruise suits you better. Upstream Yangtze cruises from Yichang sail for 5 days and 4 nights, at the average speed of about 15-18km/h, which is more suitable for traveller guests who want to spend a relatively leisure and relaxing holiday along the river. While the downstream Yangtze River cruises from Chongqing need 4 days and 3 nights, with a speed between 28-30km/h, and such kind of cruise is chosen by over 90% of all Yangtze River cruise tourists, and also a better choice for people with limited travelling time in China. For an upstream cruise, to enable travellers enjoy the shore excursions during the daytime, the ship with lower speed needs to sail at night, which may influence a little people who are very sensitive to motion sickness or have a light sleep. And for downstream cruises, they dock and never sail at night, so travellers can have a good sleep onboard. However, both upstream and downstream cruises arrange and sailing time well to make sure all attractions and sightseeing pass during the day, so guests will miss nothing during the cruise trip. For upstream and downstream, the boarding time at embarkation port an leaving time at disembarkation port vary a lot. Check each time at below for you reference. Optional experience of Ship Lift and visit of the Three Gorges Dam Site, and transferred to Yichang Three Gorges Center Cruise Terminal. Visit of the Three Gorges Dam Site, and transferred to arrive at Yichang Three Gorges Center Cruise Terminal. Moreover, as shore excursion sites are arranged differently for an upstream and a downstream cruise, the scheduled visiting time and hour are various. The prices of Yangtze River upstream cruises may be lower than that of downstream cruises for some Yangtze cruise companies, usually about 10%-30% lower. You can contact our professional Travel Consultant who will give a nice quotation of your favorable cruise ship. If you are planning a Yangtze River cruise after a tour in destinations like Beijing, Xian, Guilin, etc. you can plan a downstream Yangtze River cruise from Chongqing, since very convenient flights will transfer you from those cities to Chongqing for your embarkation. Also since Chengdu is connected with Chongqing by the 1.5-2 hours high speed train frequently running every day, you can also enjoy a downstream cruise after your discovery in Chengdu. And if popular cities like Shanghai, Zhangjiajie, Wuhan, and so forth would be your previous stop of the Yangtze River cruise experience, the upstream cruise starting at Yichang would be perfect for your China tour, because there are many high speed trains from Shanghai and Wuhan, and convenient trains from Zhangjiajie to Yichang. You can check our China Yangtze River tours covering the hot destinations, gateway cities, and recommendations of other guests to plan your lifetime China tour with the Yangtze River cruise trip. Also, you can contact our Travel Consultant to customize a perfect tour for you based on your demands and ideal places. BECAUSE I DO HISTORY AT MY SCHOOL AND I JUST WANT TO KNOW WHY DO THE YANGTZE RIVER FOLLOWS FROM WEST TO EAST. Thanks for your question. To know why the Yangtze RIver follows from west to east, you should know something about China's geography and terrain. The east of China consists of fertile lowlands and foothills, and the west is dominated by rolling plateaus and towering massifs. In general, the land is high in the west and descends to the east coast. The Yangtze River rises in Tibet (the higher part in west of China), flows through Central China and enters the East China Sea near Shanghai. May this simple explanation do some help for you. Thanks for your question. The main purpose of building Great Wall is to protect Chinese states and empires against the raids and invasions of the northern nomadic groups. The Great Wall is also good for border controls.